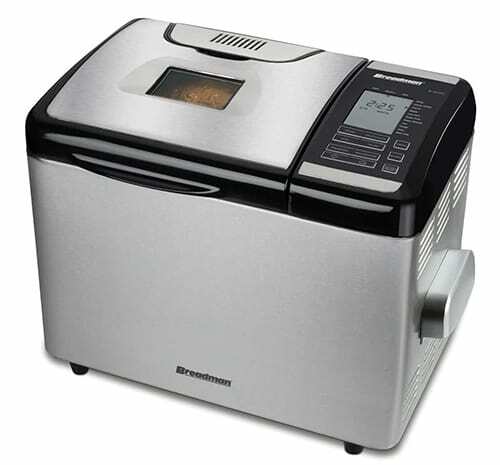 The Breadman TR2700 looks like a scaled-down version of a commercial bread maker. The machine can bake a size of loaf and houses a number of outstanding features on a large, well-laid-out control panel. However, the occasional unreliability of the unit makes it a bit of a gamble. The Breadman TR2700 has11 pre-set functions, a good deal more than many competing models at this price point. Among the functions are pre-sets for White, Whole Wheat, French, and more… the usual array of choices. However, you can also easily make Sweet, Low Carb, and even Gluten Free with this unit. There’s also a setting that makes it easy to prepare Pizza Dough and, unlike some models, the unit has plenty of power for kneading it thoroughly. That Gluten Free setting deserves a little more attention. It’s unusual to see a pre-programmed setting for a style of bread that is notoriously tricky to make well. Breadman deserves much credit for recognizing that and supplying a built-in, easy-to-set option. The TR2700 Breadman machine measures 19″ x 11″ x 15″, which is sizeable enough to make any type of loaf. That’s unusually large for a mid-price bread maker. Though the loaf weight is no greater than average – there are 1-pound, 1.5-pounds, and 2-pound options – the result will be plenty of slices for everyone. The TR2700 has a large width and, therefore, creates horizontal-shaped loaves. Vertical bread may be just as tasty but it’s trickier to slice into an attractive presentation. The TR2700 is enclosed in a stainless steel case that is easy to clean. The large case houses a Mylar control panel and has a good-sized rectangular viewing window. Therefore, you won’t have a problem seeing everything that goes on inside during every cycle. When it comes time to remove the bread, the large lid has a conveniently large lip you can flip up with ease. The pan is non-stick and, therefore, cleaning is also not a problem. The TR2700 also has an automatic ingredient container. If you like adding raisins or nuts mid-cycle but are a little forgetful sometimes (or just too darn busy) – this feature is a real loaf-saver. The little cup at the top is easy to access and is no trouble cleaning later. If you like experimenting with alternative bread loaves, you will love the automatic nut and fruit dispenser and cycles specialized for low carb and gluten free recipes. With more than 100 baking options and 16 different settings, there is no bread that you cannot make with the TR2700. The delay timer is also a cut above the competition. You can set it for up to 24 hours ahead. The delay timers of most competing bread machines only go up to 13 hours, which is fine for overnight or “away at work” advance preparation. However, if you take a day trip somewhere, or perhaps have a recipe that calls for substantial resting time for the ingredients, the 24-hour delay time would come in handy. The Power Backup feature is equally above the competition. Many bread makers will keep their settings through a power outage lasting 5 or 10 minutes. With the TR2700, the machine can last up to 60 minutes! Possibly, the best feature of the TR2700 is the “convection oven”. The mechanism circulates hot air throughout the chamber, ensuring a superbly even bake around the entire loaf. No more hotspots or crusts that are either too light or too dark. When you combine that with the ability to store up to five different recipes – to customize kneading time, baking time, and more – you know you’ve got a winner. But even with all its excellent features, there are a number of things that can make the Breadman TR2700 an iffy choice. They all boil down to the quality of the machine. One of those potential trouble spots is the mechanism that keeps the pan securely in place. The side clips used in this model are a common feature on bread makers. I prefer bread machines that have a means of securing the pan at the base. Such pans are usually easier to get out and keep it rock solid during operation. Still, many models with side clips work fine. Regrettably, the TR2700 isn’t always one of them. Because of variances in the manufacturing process, they can be too far apart, too close, or just too stiff or flimsy. That means either the pan isn’t well secured – leading to well-known baking problems – or too tight, making it hard to remove. In the first case, it can lead to an uneven knead, if not outright failure. When the clips are too tight you might even have to use a screwdriver to pry the pan loose. This is not something you want to do ever, especially with hot bread still inside. 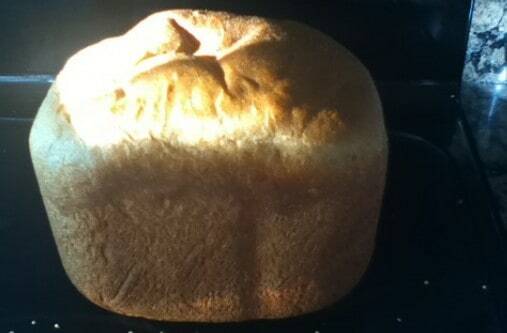 The problem of uneven baking suggests that the convection feature isn’t working quite right on some of the machines. Or, it might be a heating element that stays on too long. Whatever the basic cause, it’s not a design problem because it affects only a certain percentage of bread makers. 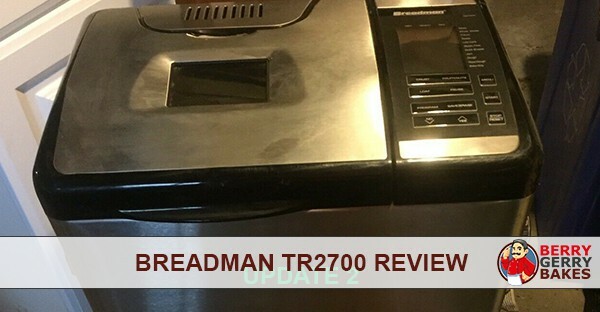 The Breadman TR2700 is a stellar bread maker – when it works right. That’s the case in about 80% of the units out there. Unfortunately, that 20% is large enough to make me wary of recommending this model when there are tons of fine bread maker machines out there still going strong after 10 years or more. Majority of customers are happy with this model. The best thing is, if you buy the bread maker on Amazon, you can always return the machine back if it’s not working. The machine’s motor is more powerful than that of its predecessors. You won’t hear it laboring over heavy dough! When you buy the Breadman TR2700, you will get a recipe book with hundreds of recipes that you can try. The Breadman TR2700’s comes with s 2-year warranty.